Through hands on projects focussed at delivering holistic solutions and ‘immersion’ windows that allow for interactions with relevant industries and user groups, the program ensures rigorous projects that span various themes relevant to our times. Students get to choose themes pertaining to a wide range of topics based on their interest and capabilities. 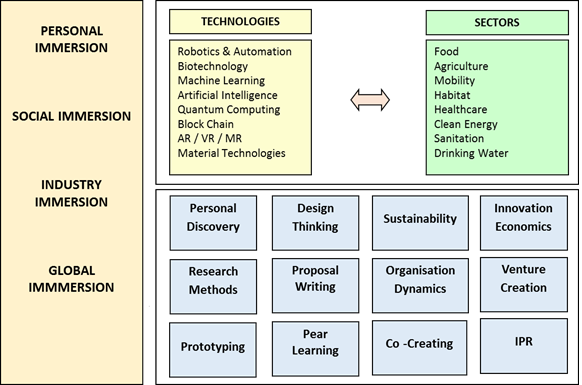 Students would go through half a year of faculty-initiated projects spanning human centred design, business studies, digital and physical product design and development, trends forecasting, technology futures and scientific research and development. This will be followed by a 20-week major project led by the students to apply the learnings and deliver a strong, impactful, innovative solution. The program is spread over 50 weeks during which students undergo a variety of learning experiences in the form of taught courses, workshops, boot camps, masterclasses, research trips and most importantly the projects. One of the important component of the program is the immersion experience that provides the students an opportunity to discover their inner potential and reflect on their learning and progress in the program. The aim of immersions is to achieve clarity about technological possibilities to make an idea feasible, about the people and society that one is designing for and about realising a student’s own potential in making the change they wish to make. The curriculum is developed by a team of young and dynamic innovators and designers under the guidance of experienced industry and academic professionals. The program is delivered through rigorous projects continuously supported and mentored by industry experts and faculty members. This module will establish the premise that innovation is cognitive activity and innovation requires one to shift from a conventional way of thinking to a mindset of experimentation and learning by doing. An introductory project that gives students a free reign to come up with a valid business / design / technology solution in diverse groups, helping them unlearn what they know and add a holistic approach towards innovation. Students will work with various organisations and establishments that work closely on social topics to deliver relevant solutions understanding pain points of the people they are designing for. This will culminate in a business-style innovation pitch. This is a digital and physical product design and development course that culminates in prototypes and an exhibition. Students will work on brand values and emerging technologies to deliver robust prototypes to demonstrate their ideas. Starting from mapping political, economic, social and technological trends, students will forecast their versions of a future world and extrapolate human interactions, products and services in each. They would then present solutions through various media. Working solo, or in groups of two, students will spend the second half of their VIF journey coming up with a strong major project that applies everything they’ve learnt so far, in a rigorous structure to deliver a holistic innovation. This output would demonstrate what moves them in the world that they live in and their technological, design and business prowess to achieve the change they are dreaming of. The program has a majority of faculty members who are industry professionals and come with a rich experience of driving innovation projects. Apart from this, industry immersions, internships and capstone projects are an integral part of the program. This enables the candidates to gain the skills and knowledge that are most relevant in the industry and prepares them for a variety of innovation related roles. A hands-on and practical approach of learning imbibes the students with a confidence to deliver superior value to innovation initiatives in an organisation. An expert team of mentors and career advisors regularly review the performance and outcomes of the Fellows and enable the candidates to choose the appropriate career path and chart the professional journey as per his/her aspirations and capabilities. Innovation Strategist, Product Development/ R&D, Strategy and New Business Development, Digital Business Strategist, Technology Commercialization, Innovation Management, Design and Development, Design Management, Product Management, New Product Development, Innovation lead, Entrepreneur.